Banffshire & Buchan Coast SNP MSP Stewart Stevenson today [Thursday] welcomed the Scottish Government's commitment to the dairy industry. In an Oral Question to the Minister, he invited the Scottish Government to address recent challenges facing the dairy industry in the North-east. Mr Stevenson went on to reference the positive work of NFU Scotland, Opportunity North East and Aberdeenshire Council who are commissioning an evaluation of alternative processing options in the North-east. “Due to challenges within the market place it remains difficult for our dairy producers to get a fair price. Therefore it remains essential that we continue to develop industry supportive strategies. “I welcome the commitment of the Scottish Government to work with all stakeholders and assist the industry through this difficult time. Equally, I commend the action of NFU Scotland, Opportunity North East and Aberdeenshire Council decision to initiate the evaluation process for alternative dairy processing options in the North East. Banffshire & Buchan Coast SNP MSP Stewart Stevenson has hailed new figures showing 99% of Aberdeenshire schools reach physical education targets and an increased uptake by those eligible for free school meals. The SNP extended free school meals to all children in P1-3 in 2015, a policy benefitting around 135,000 children and deliver savings for families of at least £330 a year for each eligible child. The Healthy Living Survey 2016 also showed that the number of primary school pupils in Aberdeenshire receiving at least 120 minutes of PE has increased from 79% in 2012 to 99% this year. “The SNP is making sure every young person has the best start in life. The delivery of free school meals for all primary 1-3 pupils is part of that commitment. We continue to do all we can to uplift our young people by tackling inequality and poverty. “The latest Healthy Living Survey shows an increase in the number of primary schools reaching the target of 120 minutes of physical education across Aberdeenshire. This is a welcome step in guaranteeing our children begin their lives as both physically active and healthy. “Being active in childhood is critical to development and encourages healthy habits vital to helping children learn. These figures once again demonstrate the SNP Government is successfully encouraging Scotland to be a healthier place. Banffshire & Buchan Coast SNP MSP Stewart Stevenson has called for the reinstatement of the post-study work visa. Mr Stevenson challenged the UK Government to reintroduce the post-study work visa during a debate in Scottish Parliament. He stressed the impact the policy failure had on rural communities and the need for a policy that works for Scotland. The post-study work visa was scrapped by the UK Conservative-Liberal Democrat Coalition Government in 2012. “The decision to scrap the post-study work visa and wider UK immigration policy does not suit Scotland. The post-study work visa was an effective policy that allowed the retention of exceptional people prepared to invest in Scotland. “Scotland has a historical problem of emigration. We can see through data that while the Highlands and Islands have a high employment rate but it tends to be part-time jobs and coupled higher numbers of people that are of pensionable age. Scotland’s rural communities can only benefit from young talented families like the Brain family. “An effective system would allow Scotland to take advantage of the incredible abilities that people wish to bring to this country. There are many very bright and gifted people throughout the world, we should be welcoming them. “Much of the academic and social success of the US has been based on a visa system built to attract talented individuals. The system allowed the country an almost magnetic pull for much of the world’s brilliant minds, there is something to learn there. Banffshire & Buchan Coast SNP MSP Stewart Stevenson has welcomed new figures showing 9 in 10 children are registered with NHS dentist. Mr Stevenson has welcomed statistics which show 89% of children in Aberdeenshire are registered with an NHS dentist. Under the SNP Government dental registration has increased sharply from 52% of the population in 2007 to 91% nationally today. For the first time there is no difference in dentist registration rates between children living in the most and least deprived areas of Scotland. 91% of children in the most deprived communities are registered with an NHS dentist - the same rate for the least deprived. In March 2007, these figures were 52% and 76% respectively. “The SNP is committed to ensuring that everybody who wants access to NHS dental services can receive it. “Substantial investment by this government has meant that dental registration has increased from 52% of the population in 2007 to 91% today. This shows the continued success of the Scottish Government in strengthening public services for benefit of all. “Scotland has shown clearly that, as a nation, it wishes to remain part of the European Union. “That is not to say that we agree the EU is perfect: it is not. But where we have been let down in Europe in the past, for example in fishing negotiations, is because we have had no-one sitting at the table speaking for Scotland’s fishermen. “The SNP has long called for the return of control over fishing resources to our fishing communities. In the turmoil which we are now facing, it’s important the UK Government does not overlook these vital interests. “With the prospect of exit from the EU now a reality, there will be a lot of people asking themselves what happens next. For our farmers, the question of subsidy payments will be a key issue and I am not at all confident a UK Government will seek to continue these in the present form. “For business, such as food processing, the question of what happens to key workers who are EU nationals will be fundamental. “For individuals, the prospect of having to apply for visas to go on holiday in Europe – and a whole raft of other issues – is important. Banffshire & Buchan Coast SNP MSP Stewart Stevenson has called for UK support for the oil and gas industry. Mr Stevenson called for investment and exploration in the North Sea. He went on to stress need to retain skills from the sector and the dangers of fracking during an economy debate in the Scottish Parliament. Exploration levels in the oil and gas sector currently sit at an all-time low. Recent projections for 2016 estimating half the number of exploration wells compared to 2015. “There is still huge potential for investment in the oil and gas sector. A third of our oil remains in the North Sea and that is without any new discoveries. Oil is still being found, as evidenced by the massive Johan Sverdrup field, discovered a few years ago in the Norwegian area of the sea. “Equally, there was an opportunity to transfer the skills of those in the north-east to sustainable renewable technology. UK Conservative Government policy has denied this. The decision to remove investment in renewable energy industries has been particularly damaging to the prospects of employment of those in the north-east. “Today the Conservative amendment sought to impress the idea that fracking was an easy alternative. The answer is not fracking. What the Conservatives choose to ignore is the damage that any such action might have. “We can learn from the experience of the United States on this. Their experience indicates that people are exposed to known carcinogens, deadly lung disease and a general decline in health. While the US Environmental Protection Agency reports that there is uncertainty, research does show that there are 12.2 spills for every 100 wells, spills reach surface water in 9% of cases and caused contaminated soil in 64%. Banffshire & Buchan Coast SNP MSP Stewart Stevenson challenged Conservatives to acknowledge their incoherence on civil liberties. Mr Stevenson delivered the challenge to Liz Smith MSP while in Parliament during a debate on the Scottish Government “Named Person” policy. “The Conservative position is a smoke screen. “It is disturbing that Conservatives seek to paint the ‘Named Person’ policy as having a significant impact on where parents stand in relation to their child’s named person. The highest court in the Scotland has stated that there is no effect on the legal, moral or social relationship within the family. “The Named Person policy is there if and when families need it. If they do, they have a statutory right to approach someone for answers and support for their children. Parents cannot be compelled to accept advice or support. “If the Conservatives were really worried about civil liberties, they would have resolutely opposed the actions of the UK Tory Government to pass the ‘Investigatory Powers Bill.’ This act will have far reaching consequences, the very least being that the UK Tory Government will be allowed to gather information on the medical records of everyone in the UK and on Children’s activities. Banffshire & Buchan Coast MSP Stewart Stevenson is asking his constituents to help Cure MND and support Global MND Awareness Day on 21st June. Motor Neurone Disease (MND) is a rapidly progressing terminal neurological condition which affects the signals from your brain reaching muscles, causing muscle weakness and wasting. It can affect the ability to eat, sleep, walk, talk and breathe unaided. Average life expectancy from diagnosis is just 14 months and it is not yet known what causes it. There is no effective treatment or cure. Funding MND research is a key priority for MND Scotland and during Awareness Week they will be highlighting what could be achieved with more funding. 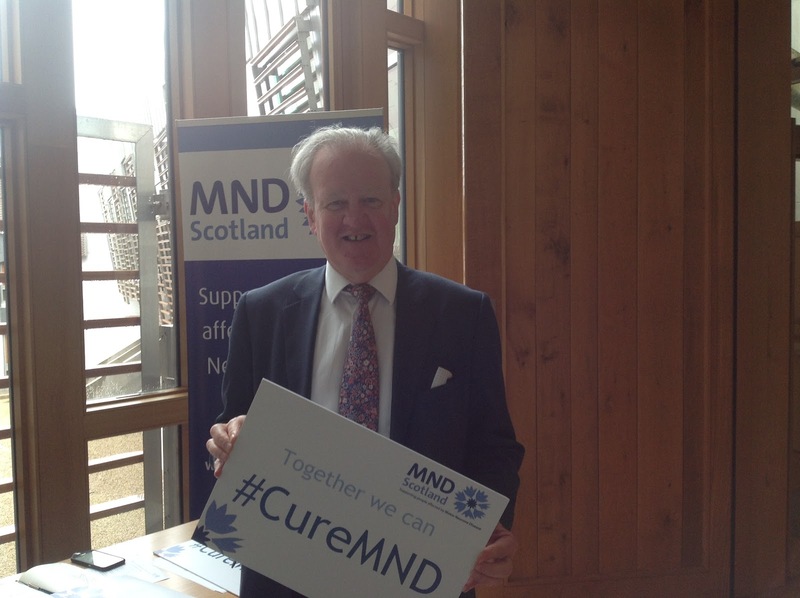 “MND has affected people across Banffshire & Buchan Coast. MND Scotland provides care and support to people affected by the illness alongside cutting edge research to try and find a cure. “This research and care is essential to helping those suffering from MND. We must continue to develop our understanding of the disease if we are to find a cure. “Scotland is fast becoming one of the go to places to conduct MND research and MND Scotland’s Awareness Week campaign aims to raise £15,000 to invest in to further research projects. “MND is a rapidly progressing terminal illness with no effective treatment and no cure. During MND Awareness Week 2016 we want to increase public awareness and understanding of MND. Funding for MND Research continues to be a priority for MND Scotland but with additional support we can do more! Text CUREMND to 70660 to donate £5 to MND Scotland. Projects being brought forward by Findochty Community Council and the Buckie Area Forum have benefitted from cash awards made as a result of a ‘participatory budgeting’ exercise held recently. The funding for the event was provided by the Scottish Government and Moray Council. “This event seems to have gone extremely well and I am delighted for Findochty Community Council and Buckie Area Forum who will be receiving funding for their projects as a result. “Participatory Budgeting (PB) is recognised internationally as a way for local people to have a direct say in how, and where, public funds can be used to address local needs. It originated in Brazil in the late 1980s and has since spread to over 1,500 localities around the world. It was born from a desire to reallocate public money locally and democratically to where it was needed most. Banffshire & Buchan Coast SNP MSP Stewart Stevenson has challenged the Conservatives to acknowledge their incoherence on civil liberties. “It is disturbing that Conservatives seek to paint the ‘Named Person’ policy as having a significant impact on parents’ relationship with their children. The highest court in the land has stated that there is no effect on the legal, moral or social relationship within the family. 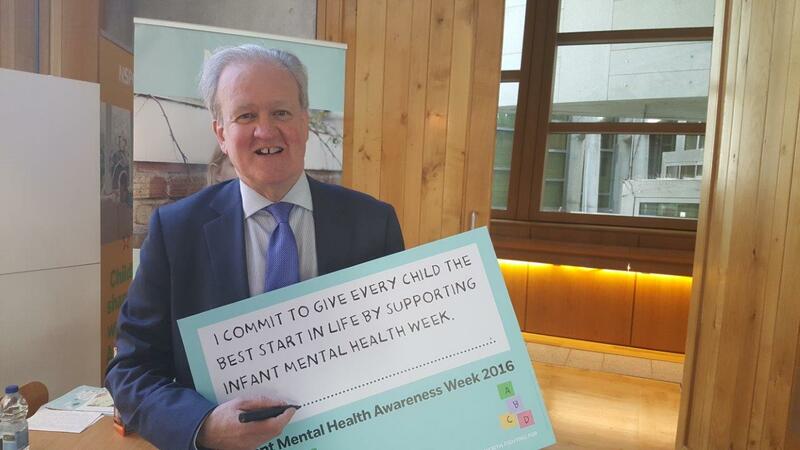 Banffshire & Buchan Coast SNP MSP Stewart Stevenson has given his support to the National Society for the Prevention of Cruelty to Children (NSPCC)’s Infant Mental Health Awareness Week 2016. Mr Stevenson joined officials from the NSPCC in Parliament this week to promote the initiative which is aimed at giving all children the best start in life. “The work of the NSPCC and the Infant Mental Health Awareness Week campaign is vital. The NSPCC contributes greatly to our understanding of infant mental health and the cost of overlooking it. “Research suggests that in early months the permanent architecture of the brain is being developed at a rate of 700 new connections per second. Trauma and neglect can disrupt and damage this process, putting mistreated children at greater risk of health problems and poor outcomes.